After a longish absence from the saddle due to many and long trips to Plymouth, the Christmas/New Year hiatus, Welsh rain, and wind, and unbelievably muddy and soggy roads I finally made it out, not once but twice this week. It is absolutely time to reacquaint myself with hills already climbed and to acquaint myself with new ones. Walking the new dog just does not help with what they call hills around here and what some of us might call absolute beasts of climbs. Tuesday was a ride of chores – the notary and post office in the nearby village, though the puddle on the Hill Road meant I went around the hill via mucky farm (it lived up to its nickname) and then down to the town via the Kerry Road – a road that I had wanted to try out as it offered a different way into town. One might describe it as undulating, and the climbs were OK. It was the descent that was particularly challenging – a steep, muddy, gravelly, free-running water, breaking up lane that needed constant pressure on the brakes and a sharp eye to avoid holes and thorns as the winter has not yet cleared the final bits of hedge from the autumnal clipping. Amazingly you come across houses which do not seem to be farms on these back lanes – so remote that you can hear everything around you, no noise pollution. And yet such residents are not hermits. Even more amazingly spring is trying to spring; scattered clumps of snow drops and a few primroses in bloom and one bunch of narcissi waving yellow heads. But I don’t think I will be a regular along that road. But the snowdrops are out in full bloom, cascading down banks and more primroses though the hedges are not quite the bocages of Normandy. Just wonderful to get out and about again and clear the cobwebs even if it does mean that the bike needs a full clean when you get home. Peter – Glad to hear you are out and about, hope the fitness is building up. Good to hear from you Julian. Had a nice ride with Clive yesterday, spotting the first blooms. Definitely snowdrops, but also aconites, daffodils and celandines. 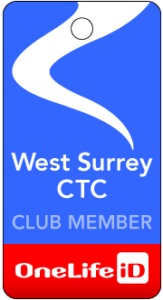 Keep the WSCTC flag flying!